IMCDb.org: 1950 Buick Roadmaster Estate Wagon  in "Julie & Julia, 2009"
It's a beauty all right! dragonboy wrote First up is that looker of an estate, the Buick Roadmaster. Even though the current pic is clear HD quality, it's not technically from the film. 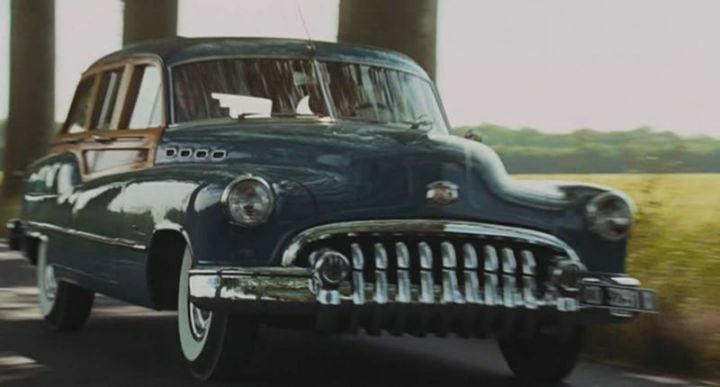 In the movie Julie and Julia, the Buick Estate Wagon is clearly a 1950 "four-holer" Roadmaster, but with a '49 style two-piece windshield. My Buick reference book doesn't mention such a configuration, and even my memory says the windshield was one piece. One web page I came across states, "Special still has the split windshield", which logically means that the Super and Roadmaster didn't. I had a 1950 Roadmaster 4-door sedan in the 60's and I can report that 0-60 was 13 seconds flat using Low to 30 then shifting to Drive. In case anyone was wondering what 152 horses can do when applied to the road through a Dynaflow.